Hanging Basket Care | Maple Leaf Lawncare Inc. Your flowering hanging baskets can bloom and thrive for many months- with a little help from you. Follow these easy guidelines to keep your plants healthy and beautiful throughout the season. Match your plant’s location with its light and heat tolerance for best results. Most flowering hanging baskets will continue flowering in shade or partial shade, however some will not tolerate the heat and dryness of all-day sunlight. Ivy and zonal geraniums tolerate the brightest and hottest conditions and an occasional drying out. Petunias also appreciate a sunny location. Impatients and begonias keep the shadiest spots bright but may not hold up in high light and heat. Fuchsia do best in a spot that gets some shade during the middle of the day. Don’t wait for wilting as your cue to water! Flowering plants do best if you never allow them to wilt. Take extra care with watering since hanging plants dry out faster than garden plants, because they’re exposed to more wind and warmer temperatures. 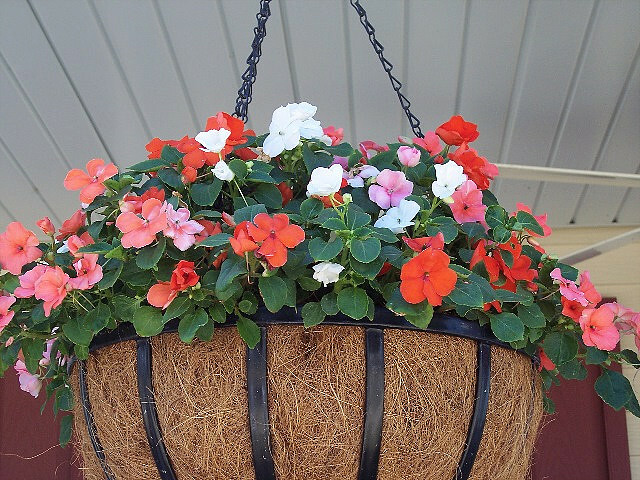 Under average conditions, flowering plants in 10-inch diameter hanging baskets use 16 fluid ounces of water per day. With proper watering, the plants should last 2-4 days between waterings. Be sure to water thoroughly. If the basket dries out, the soil may shrink and allow the water to quickly run out the drain hole, fooling you into thing it’s thoroughly watered when, in fact, the water is bypassing the roots. Make sure the basket becomes heavy with water, about 7-9 pounds. You may need to re-water the basket again in 15 minutes- or soak it in a bucket of water for 5 to 10 minutes to thoroughly moisten the soil. Even if you’ve never allowed them to wilt, your plants may develop yellow leaves and poor flowering which can indicate a need for fertilizier. Add 1 or 2 teaspoons per gallon of water-soluble fertilizer that has 15 to 20% nitrogen into the watering can every two weeks and your baskets should stay green and flowering. You can also use, plastic coated slower-release fertilizer beads available from some greenhouses and garden centers. Apply one to two tablespoons to the soil surface at the start of the summer to last all season long. Keep in mind that if a little fertilizer is good, a lot is NOT better. Too much fertilizer can burn roots and damage plants. Ask someone at your local garden center or greenhouse for help and invest in a little fertilizer to keep your plants flowering. With proper watering and fertilizing, your basket plants will flower so much that you may need to remove dead flowers and seed pods. This helps keep the plant looking its best – and is a nice way to relax after a long day, which is what gardening is all about. Don’t forget your flowering hang-ups when you go on vacation. If you can’t get a “plant-sitter” to water them for you while you are gone, take them down from their hangers and set them on the ground in the shade. With a thorough watering before you leave, most plants will last a week on the ground in a well shaded location. Flowering may be reduced when you first re-hang your plants, but they will soon return to their summer glory. If your plants get large and overgown, right before you go on vacation is a good time to trim them back adn remove some of the extra growth. Commercial plant growers have worked with researchers at Michigan State University to produce beautiful, healthy flowering hanging baskets to entrust to your car.e Follow these guidelines to keep them beuaitufl and health- and to get the most from your investment. Take the time to learn how to care for and enjoy your plants. Information from Michigan State University with the help of the Western Michigan Bedding Plant Association, Bedding Plants Foundation, American Floral Endowment, and Professional Plant Growers Association.